The Supreme Court yesterday upheld the order of a Federal High Court in Port-Harcourt, which last year barred the All Progressive Congress (APC) from conducting any primary election pending the determination of a suit brought before it by a team of 22 aggrieved members of the party. In a swift reaction, The Rivers State chapter of the APC urged Rivers people and other lovers of democracy “to ignore Senator Magnus Abe) and his allies for misrepresentation of facts on the Supreme Court ruling,” insisting that the candidacy of Tonye Cole and others of APC was not imperiled. The apex court in a judgment yesterday set aside the ruling of the Court of Appeal in Port Harcourt, which in October last year, upturned the interlocutory order of the high court in the political case. 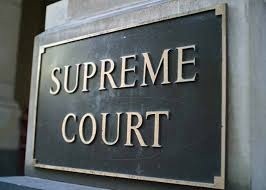 In a unanimous judgment by a five-man panel of justices, the Supreme Court refused to tamper with the high court judgment that ab-initio barred the APC from conducting its ward, local and state congresses in Rivers State, pending the determination of a suit filed by 22 aggrieved chieftains of the party. The plaintiffs led by Ibrahim Umar, had on May 11, 2018, secured an interim injunction from a High Court in Port Harcourt, which restrained the APC from going ahead with the indirect primaries that held on May 19, 20 and 21 respectively, which produced Tonye Cole as governorship candidate and other candidates to represent the party in the 2019 general elections. The APC had through its lawyer, Prince Lateef Fagbemi (SAN), begged the Supreme Court to clear legal impediments against the faction loyal to the Minister of Transportation, Rotimi Amaechi and allow its list of candidates that contained Tonye Cole’s name. But the request was rejected by the panel of the apex court judges, led by Justice Mohammad Dattijo. The court instead re-affirmed its previous ruling that validated the order of a Port Harcourt Federal High Court order, which barred APC from conducting its Rivers primaries. The Supreme Court invoked Section 22 of its Act, which allows it to take over a matter and give final judgment to decide on the appeal. In a lead judgment delivered by Justice Sidi Barge, the apex court held that by virtue of Section 11 Rule 5 of the Appeal Court rules, the appeal against the high court ruling having been withdrawn by the APC is tantamount to outright dismissal. Justice Barge posited that since the Court of Appeal failed or evaded to make dismissal pronouncement on the said appeal, the apex court has no choice than to invoke section 22 of the Supreme Court Act to assume jurisdiction over the case and decide on it. The judge declared: “It is my considered opinion that this appeal must be given a decent burial. The appeal having been withdrawn at the lower court by the respondent is deemed distilled. “This is what the lower court failed or evaded to do. Therefore by virtue of Section 22 of the Supreme Court Act 2004, the lower court having failed to exercise its powers provided under Order 11 Rule 5, this court is bound to do so. The Ojukaye Flag-Amachree’s led APC had appealed the ruling of a Port Harcourt Federal High Court judge, Justice Chiwendu Nwogu, which nullified the APC state congresses and the nomination of Tonye Cole as the party’s governorship flag bearer in the forthcoming general elections. Justice Nwogu had on May 11, 2018, granted an interlocutory order restraining the APC from conducting any local government area congresses in the state. The appeal was however withdrawn on the order of the National Secretariat of APC at the Court of Appeal but the court refused to dismiss it as required by law. In the appeal to the Supreme Court filed by Ibrahim Umar on behalf of their faction, the Supreme Court agreed with them that the APC’s appeal at the Court of Appeal, having been withdrawn was liable to dismissal and not striking out. The Peoples Democratic Party yesterday said the judgment of the Supreme Court, upholding the nullification of the primaries of the All Progressives Congress in Rivers state, was a victory for democracy and the rule of law. He stated that the judgement had saved the nation from a serious constitutional crisis that could have marred the 2019 general elections. Meanwhile, the Rivers State chapter of the APC has urged Rivers people and other lovers of democracy to ignore Senator Magnus Abe (Rivers Southeast) and his allies for misrepresentation of facts on the Supreme Court ruling, insisting that the candidacy of Tonye Cole and others of APC was not imperiled. Cole, who is a co-founder of Sahara Group, still expressed optimism that he and other candidates of APC in Rivers would be on the ballot for the elections and they would emerge victorious. The main opposition APC also called on the teeming supporters of the party in Rivers to remain calm, while assuring that it would surely end in praise and declared that candidates of APC in the state would surely be on the ballot and go ahead to win on February 16 and March 2, 2019. In his reaction, Abe described the ruling of the Supreme Court as a stunning victory for Democracy, Justice and the rule of law in Nigeria. Abe, in a statement issued by his spokesperson, Parry Saroh Benson, reiterated that the issue in Rivers APC had always been about inclusion, justice, respect for party members and adherence to due process. “The victory at the Supreme Court this morning is a stunning victory for Democracy and Justice. The God of justice has spoken and every other voice must now be silent”.”We had always maintained that only one valid and lawful primary election was conducted by the APC in Rivers State, because the indirect primaries did not exist in law.